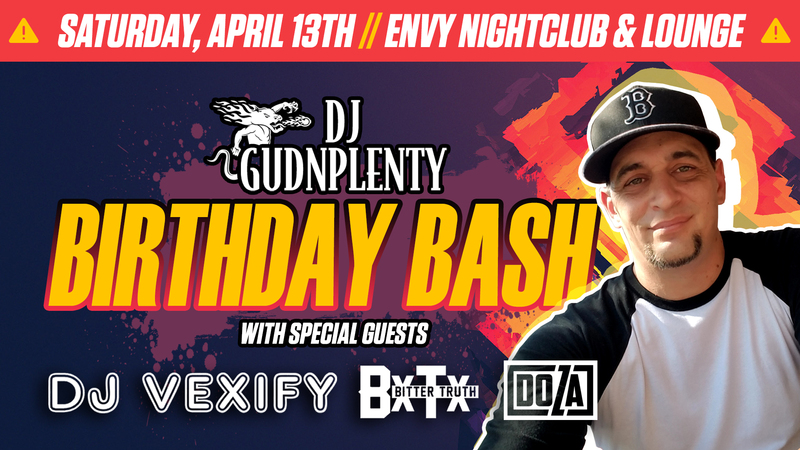 Saturday April 13th at Envy Nightclub and Lounge in Mesquite, Come celebrate with the birthday boy DJ GudNPlenty, with special guest sets from DJ DOZA and DJ Vexify, as well as a LIVE performance by Bitter Truth! Enjoy ALL your favorite Top 40, Old School and New School Hip Hop and R&B, Rock mixes, Peak Hour Mixes, Remixes, AND MORE! As well as Remixed Music videos and ALL your ON THE SPOT requests! If you can dance to it, we will play it! Call 1 (702) 346-9000 to book your VIP tables and celebrate in style!